What’s the easiest and most straightforward way to paint a surface with an even coat? SPRAY PAINTING! Yes, with the use of spray guns, you can paint any surface evenly by using thick and thin paints. Compared to a brush and a roller, a spray gun can produce an excellent uniform finish in a sound manner and minimum time. There are two types of spray guns: Gravity feed and Suction feed. This review will focus on the first one as it’s best for standard painting that may include DIY tasks or jobs requiring a maximum liter of paint at a time. You will find here some useful guidelines regarding the latest and long-lasting models of gravity spray guns so you may choose the best one for personal use. Beginners and homeowners can use this spray gun type for indoor jobs as well as outdoor projects. If you are looking forward to doing more detailed work, DeVilbiss 802342 StartingLine HVLP Gravity Spray gun kit is the best catch! It is perfect to help you highlight your work with subtle details and flawless finish. Although the design is pretty strong and functions quite well, it doesn’t seem to withstand heavy wear and tear. Thus, it’s not the best piece for regular pro use, but as long occasional DIY projects are concerned, it’s the top choice. This gravity feed spray gun kit comes with three tips to cater your painting needs and weighs only 6 pounds. That’s pretty easy to handle even for the teens. It has an average rating score that makes it worth trying! Here comes this standard gravity feed HVLP spray gun kit that provides a higher transfer of fluids while reducing overspray. It comes with a suspension hook that enables secure storage. Its built-in three knobs feature includes fluid regulation, pattern control, and air adjustment. They all work together to allow perfect results by regulating fluid properly, adjusting patterns and controlling air flow. There is also a filter in this gun that helps you get the best results by filtering all sort of dirt particles. The kit includes one large rifle and one small gun allowing you to do a detailed work as well as projects with large surfaces. Its average rating is good. It proves that it is a superior device. Here is another best gravity feed spray gun that can provide even atomization for all kinds of surfaces. It comes with a stainless steel needle and nozzle that accommodate a variety of coatings. You won’t face any fatigue while using this spray gun as it has a smooth trigger pivot and weighs pretty light. This ergonomically designed spray gun has 1.4mm steel needle and a nozzle set. Its exceptional adjustment features will allow you to regulate the fluid flow and adjust patterns. It has been rated five stars by the users who love this Spray Gun. This Central Pneumatic HVLP gravity feed spray gun offers high output with low overspray. Thus, it’s better for the environment and also helps you to save money on material costs. It comes with the incredible feature of adjustable fan pattern and volume control. It supports diverse materials including lacquers, enamels, urethanes and metallic paints that offer high versatility for automotive and hobby projects. With this spray gun, you can enjoy superior finishes by controlling the fluid and adjusting the fan patterns. It’s ideal for base coatings and primers. It also weighs pretty light. This harbor freight 47016 spray gun has an excellent rating score made by many customers. For pro painters, this Fuji 5175G spray gun is genuinely outclassing other spray guns! It comes with a convenient side pattern knob to adjust the fan pattern from small to large. It’s a new lightweight design and the strong best HVLP spray gun for latex paint. It offers higher efficiency with its air cap feature that reduces the overspray and enhances the atomization. The parts of this tool where the fluid flows are 100% stainless steel. It comes with a 600cc cup that is an ideal size for small and medium projects. It has an average rating of a high score. It shows that customers are pretty satisfied with the product. Control System! A spray gun is primarily a tool that can spray paint evenly in a quick manner. The gun comes with a trigger like attachment that allows the compressed air to atomize the fluid paint through its nozzle when pressed. 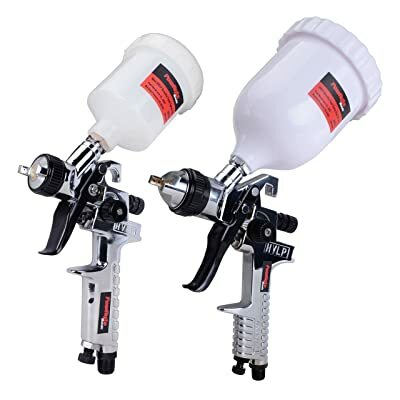 Typically, a spray gun is composed of different parts including gun system, compressed air-system, pressurized paint cup, and flexible tube to connect all of these components. Three necessary controls enable this gadget to perform impressively. The air micrometer adjusts the air pressure. The fluid adjustment controls the quantity of the fluid while fan control regulates the spray patterns. When all control systems work together, controlled atomization and even dispersion of paint through the nozzle take place. Renowned since the 1980s! Gravity feed spray guns came into an extensive use in the 1980s and since then, continue to over-shine conventional spray guns. From beginners to pros, the majority of painters prefer gravity spray guns because it doesn’t only offer better paint spraying but also a natural choice for the environment. Atomization! The main difference between conventional and gravity spray guns is also something they have in common, and that is the atomization of fluid at the tip of the gun where the paint leaves the nozzle. In every spray gun, there are two passageways: one for the air and one for the fluid. During atomization, the air is mixed with the fluid, and a mist ejects from the nozzle. In conventional feed gun type, the paint is drawn up from the bottom of the gun while in gravity feed guns, the fluid is drawn down from top of the gun. Less Air Pressure! The gravity spray gun type is widely used because of many reasons. 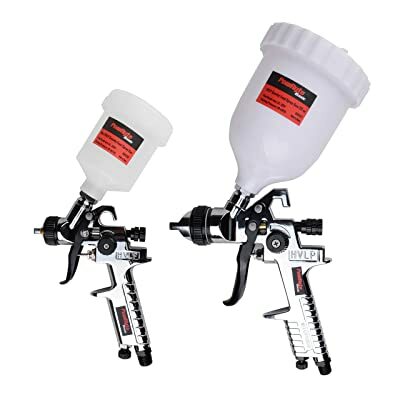 It offers less air pressure that is highly required to atomize the paint more efficiently. Less air pressure also reduces the overspray resulting in less waste and provides more control to the painters. As gravity feed guns come with paint cups on top, they are easy to clean because it can be disassembled. Moreover, it’s an efficient gun type offering better finishes and versatile coatings. Different From Conventional Spray Guns! Gravity spray guns are offering valuable benefits, but there is also one major drawback of this gun type. As it comes with a paint cup at the top of the gun, your work style can be affected by your initial attempts. It might take a few tries to get used to a gravity spray gun especially if you have been using conventional spray guns for a long time. You will learn new techniques to use gravity spray guns because the paint gets delivered twice the force of gravity. Other than that, gravity spray guns are much better than conventional guns in almost all aspects. Most of the gravity spray guns are ideal for detailed working. This spraying gadget can be used for airbrushing, and if required, more than one bottle can be applied per application. Thus, it’s perfect for those who prefer to complete their work with fine detailing but it also needs necessary consistency to cover general surfaces adequately. When it comes to choosing the best gravity feed spray guns, there are many tips and ways to do it. You have two choices, either buy a spray gun and look how it can serve you best or learn about the essential features of a gravity spray gun to find a model that suits your requirements. Prominent Features! When choosing a gravity spray gun, consider its salient features, i.e., design, mix system, trigger adjust flow and feed type. The design of the gun plays a significant role in enhancing or reducing the outcome. You want to look for a design that’s easy to handle but solidly constructed to ensure a long-lasting use. You also need to look for a gun that offers vast customization as you never know what type of detailed work you will do in the future. No matter, if you are planning on to use the sprayer for similar jobs, higher customization capability will allow you to make most of this gadget. Installation! In a gravity spray gun, the mixing system can be installed internally as well as externally. You must prefer internal mix if you’re looking forward to detail work. On the other hand, for smaller areas where you don’t need to put much effort, you can opt for the external mix. The trigger of the gun is another feature that you need to consider while purchasing this tool. Typically, there are dual as well as single action triggers. The double action allows you to push down and pull away for paint auctioning whereas single action does it automatically. It’s better to go with a single step as it makes the process easy and more straightforward. Adjustable! Spray painting becomes much more comfortable with the feature of adjustable flow. Look for a gravity feed system that allows fluid adjustment as sometimes you will need to paint slowly for perfect finishing and sometimes you will focus on covering the surface. Also check for the feed type that includes HVLP, standard and combination of both. With a fine flow adjustment and right feed type, you will be able to enjoy a high-quality finish with exquisite detailing. The Cup Size! A gravity feed spray gun comes with a cup. So you need to find a cup with an appropriate fluid holding capacity. It’s widely considered that having a bigger cup will not be your best interest because it reduces maneuverability. It also gets your hands tired sooner. On the other hand, the cup should be large enough to allow you to cover the surface in a single application without adding more paint. Considering these key points, the pros advice that a 600cc cup is neither too small nor too big. Also, check the filters of the spray gun as this feature plays a significant role in improving paint application. Filters prevent dust particles from mixing with the ejected fluid resulting in a smooth coating. Price! There are various models of gravity feed spray gun in the market with varying rates. When it comes to buying one, don’t go for the cheapest one and choose the most expensive model. You need to consider its features to decide if it suits your needs or not. A spray gun with a stronger cup is okay for those who can handle a little weight whereas beginners should always prefer smaller and lighter guns to start. The primary differences between cheap and expensive gravity spray guns are their release time and features. A new model with advanced features will cost expensively whereas an old one with lower performance will cost cheaply. When buying, you need to check if it has a potential of serving you well or not regardless of its price! It’s time for you to quit using conventional spray guns and try the advanced features of gravity spray guns. Whether you are a beginner or a pro, this gun type will serve you well. With its improved atomization, you can enjoy perfect results and even coatings. But to witness the best outcomes, it essential to buy a good spray gun with all the necessary features. From design to systems and trigger to feed type, consider all prominent features to decide if the product is capable of serving your needs well or not. With the gravity spray gun, you can experience the real fun of spray painting!